You're IT Wilton Martial Arts! Three questions with David Bankowski, owner of Wilton Martial Arts. Wilton Martial Arts opened its doors in 2005 after relocating from the neighboring town of New Canaan where they had a great six-year run. Not being able to find a new location in New Canaan after the property was sold, I decided to look in Wilton for our new home which I found at 213 Danbury Rd. After almost twelve years at that location, I found myself in the same predicament again, the property was being sold and we would have to move once again. Happily, to say this time I was able to find a new space less than two miles away, at our current location 27 Danbury Road. I started Wilton Martial Arts because I felt there was a need for a martial arts school that taught traditional martial art values and principles. We offer classes to various age groups ranging from three years old through adult. There are numerous benefits that children receive from martial arts. Just too name a few they will build their self-confidence, courage, concentration, and discipline. As parents, you will see this not only in the studio but also in school, home, and in everyday activities. Also, at the same time, they will be learning how to defend themselves both physically and mentally all in a safe learning environment. Adults will also find training is a great way to relieve daily stress, and become a healthier person overall. The skills you will learn at Wilton Martial Arts will become skills for life! Wilton Martial Arts supports the Wilton Continuing Education Program. Throughout the school year, we teach the after-school enrichment program at Miller-Driscoll School to children ranging from Kindergarten through second grade. We have also been a member of the Wilton Chamber of Commerce since 2005. As a small business, we also like to support local restaurants on our weekly night out after training. We frequently find ourselves across the street from the studio at The Little Pub. If we’re not there you will find us at Outback Steakhouse, Orem’s dinner, or another local restaurant. 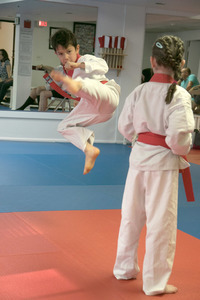 Wilton Martial Arts is located at 27 Danbury Road in Wilton. Visit them online here. Wilton Martial Arts tags Kaoud Carpets & Rugs!